Leaving last loop of each st on hook, yrh and draw through all loops. Using contrast colour and starting with 1dc, work 1dc into base of 1ch, 1dc into each dc to end, ss to first dc. Turn. Fasten off. Join in main colour and rpt last row once. Turn. Using main colour yarn and starting with WS facing, rpt Edging Row along cast on edge. Fasten off. Finishing - Weave in and trim off any loose ends of yarn, attach large decorative button. Second Round - 2ch, work 2htr into each of next 3htr, 1htr into each of next 8htr, 2htr into each of next 6htr, 1htr into each of next 8htr, 2htr into each of last 2htr, 1htr into base of 2ch, ss to top of 2ch. DNT. (39htr + 2ch). Third Round - 2ch, miss first htr, 1htr into each htr to end, 1htr into base of 2ch, ss to top of 2ch on beginning of row. DNT. Fifth Round - Working through both loops make 1ch, 1dc into base of 1ch, 1dc into each dc to end, ss to first dc. Turn. Rpt last row once. Fasten off. Work through both loops from now on. Next Row - (Dec Row) Insert hook and pull up loop from each of next 6dc, yrh, pull through 7 loops on hook to close, 1ch. Fasten off. With RS facing work 8dc evenly across top of instep (see pic). Fasten off. Next Row - 1ch, 1dc into base of 1ch, 1dc into each dc to end, ss to first dc on beginning of row. Turn. Rpt last row 4 more times. Fasten off. Join in contrast colour and rpt last row once. Fasten off. Rejoin main colour and rpt last row once. Turn. Finishing - Weave in loose ends of yarn and trim off, attach small decorative button to each boot. 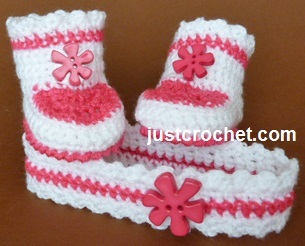 Hope you enjoy this free baby crochet pattern for a headband and boots.